Pope Francis has confirmed that he will make his first papal trip to the United States next fall to Philadelphia during the World Meeting of Families. City officials expect between 1 and 2 million people could attend the event just because of the pope's confirmed presence. Plans for the conference have long been in the works for months, but with the pontiff's announcement any speculation can be put to rest. Security will be a big concern and city officials will work on those. Unlike some of Philadelphia's other celebrations that draw large crowds to the Parkway, many will be coming from out-of-town and from around the world. The hotel industry only has around 45,000 rooms in the area. The archdiocese says families will also be offering rooms to stay in their homes for visitors. 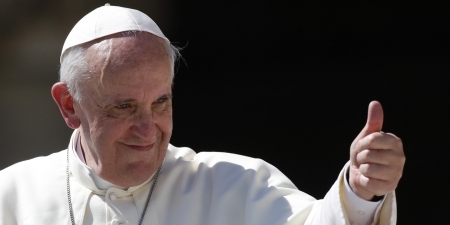 The Pope will arrive on Friday September 25th. He'll preside over Mass on the Parkway on Sunday the 27th. Five people, including an off-duty police officer, were injured in a three car pile up on Kelly Drive towards the end of rush hour Monday evening. It happened around 6:30 pm at the 2200 block of Kelly Drive. A Chevy trailblazer driving into the city lost control around a curve and headed into the path of the other two vehicles going the other direction. The Chevy flipped over on it's roof. Three of the people were trapped in the cars. None of the victims have life threatening injuries but the off-duty cop had a unspecified leg injury and another passenger suffered a broken femur.The roadways was closed for hours. Investigators are still working on the cause of the crash. Philadelphia was chosen to host the East Regional games in the 2016 NCAA Division 1 Men’s Basketball Tournament. Games in the Sweet 16 and Elite 8 rounds will be played at the Wells Fargo Center on March 25-27, 2016. LaSalle University will be the host school for the games. The other three regions will be hosted by Chicago, Louisville and Anaheim with the Final Four taking place in Houston. The Wells Fargo Center previously hosted the 2nd/3rd round in 2013. Philadelphia has hosted the tournament 27 times.